We are under way across Cape Cod Bay, en route to Provincetown. This morning found us anchored in Penzance Bay, just off the village of Woods Hole, Falmouth, Massachusetts (map), with not a single Gilbert & Sullivan pirate in sight. 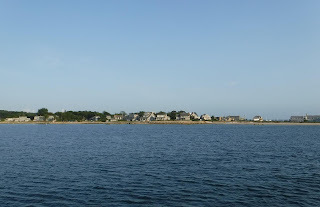 Woods Hole village from Penzance Bay. If you zoom in you can see beach-goers to the left and boats in Great Harbor across the peninsula at right. We had a good cruise yesterday from Nantucket. The current ran against us, at times more than a knot, for the first half of the trip, and we ran at 1400 rpm to conserve fuel. But by the time we were passing Marthas Vineyard the tide had turned, and as we approached Woods Hole around 1630 or so, the current was running five knots in the hole. Going through a narrow, rock-lined pass in a slow single-screw boat with five knots behind a flat transom is not for the faint of heart, and we were noodling on whether to wait for slacker tide when circumstances made the decision for us. A tug and barge were southbound in the hole from Buzzards Bay, and they were stopped dead by the current. 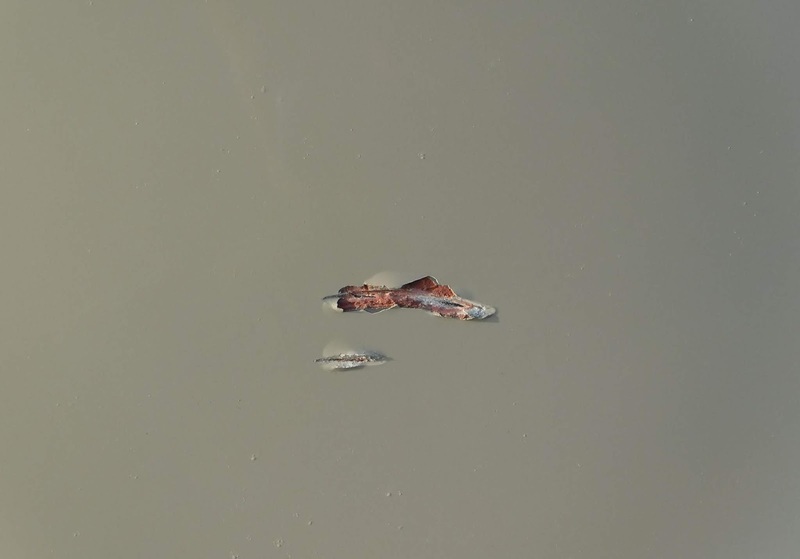 They literally sat there for nearly an hour, powering against the current and making zero headway. With the narrowest part of the pass just 120' wide, we did not want to be passing a barge with that much current behind us. We instead headed in to Great Harbor, where we had spent two nights our last time through, and dropped the hook to wait it out. Anchoring here is a challenge with a mostly rocky bottom, but it was just a lunch hook and we had no real trouble. The same can not be said for weighing anchor an hour later, after Sirius, the tug, had cleared out of the hole and the current had dropped to just under three knots. The chain ended up with a 180° twist in it and it refused to untwist while we sat there in the harbor. 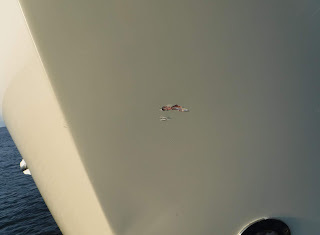 At one point, while trying to hold it straight with a boat pole while winching it in, Louise's wireless remote briefly jammed in the "up" position and the anchor whizzed aboard upside-down, slamming into the hull and taking a 3" long divot out of our nice new paint job. 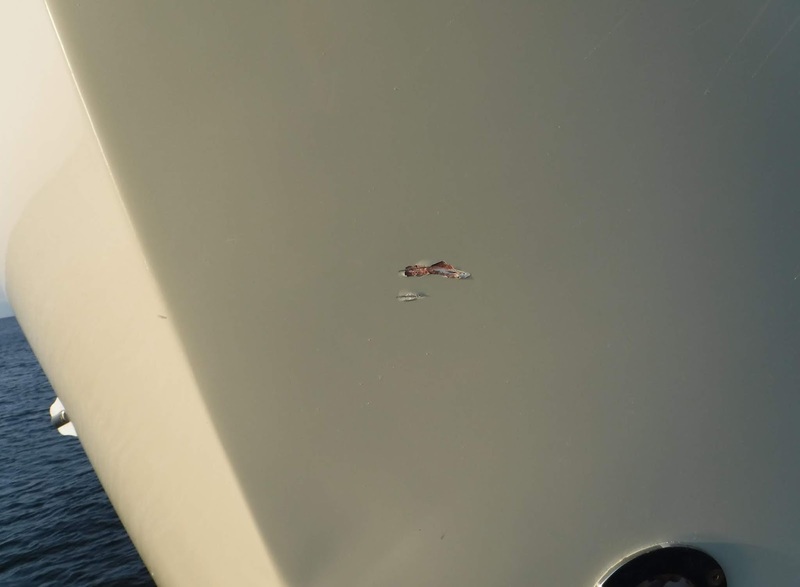 Gouge in the hull from our anchor fluke. It looks like it went all the way through the fairing compound and exposed the steel in a couple of small spots, so we'll have to get some primer on it in the next day or two before the rust starts. I'd be more upset about this, except the paint job we spent a fortune on in New Orleans 16 months ago is so crappy that we'll need to repaint the whole boat in another year or so anyway. Looks like it went all the way to steel. But it stopped there; you can't feel a bump on the other side. Even with the hour delay, we shot through the hole at nine knots and had the hook down in Penzance Bay before dinner time. Only cocktail hour had to be delayed. 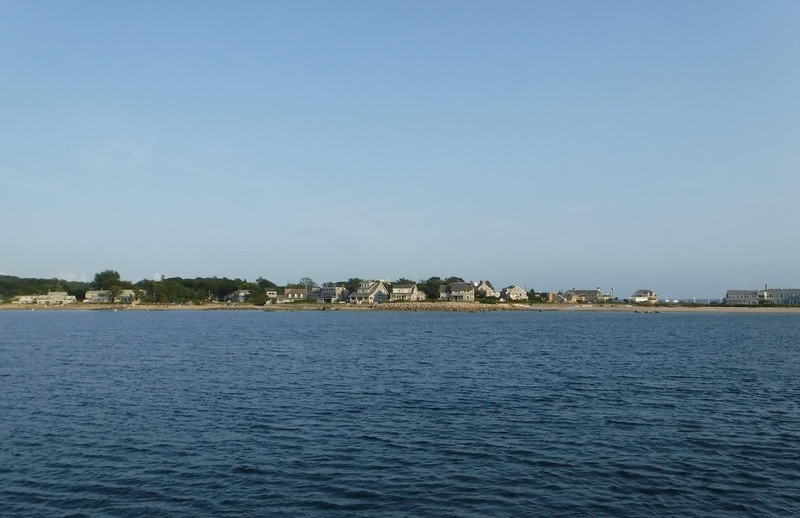 At quarter past six, Stony Beach on the shore of the bay was full of sunbathers and swimmers; Woods Hole takes its limited summer season seriously. This morning we weighed anchor right after coffee to take full advantage of the tide. We reported in to Canal Control as we passed Cleveland Ledge Light, and hit the canal right at max current. At one point we were doing over 11 knots even though I was making revs for just over six. 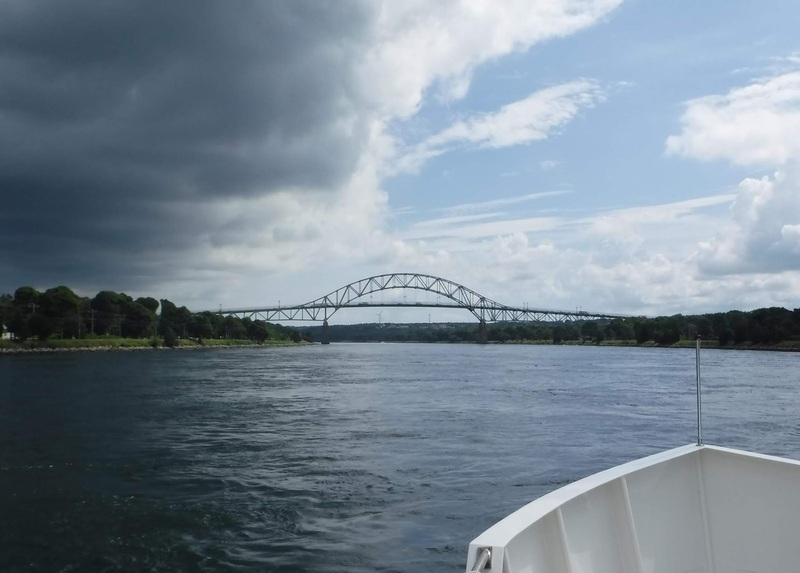 Bourne Bridge ahead, doing 11 knots. I did the full photo tour thing the first time we came through here, so this time I took but one photo, of the Bourne Bridge. 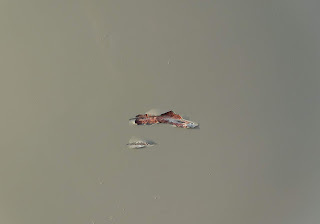 We encountered no large ships, but at one point after passing a lightboat tug pushing hard against the current, we found ourselves in three foot seas as the wakes reverberated between the hard canal walls. It's a straight shot to P-Town after leaving the canal, giving me a chance to update the blog while Otto drives. 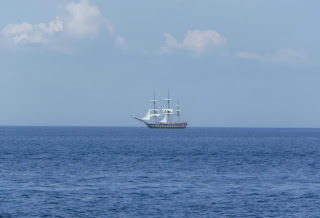 At one point I looked up to see an old-timey ship in the distance; when plying the waters between Plymouth and Provincetown I figured to encounter the Mayflower. But as she neared I could see it was much larger, a different shape, and had one mast too many. It turned out to be the sailing school ship Oliver Hazard Perry. 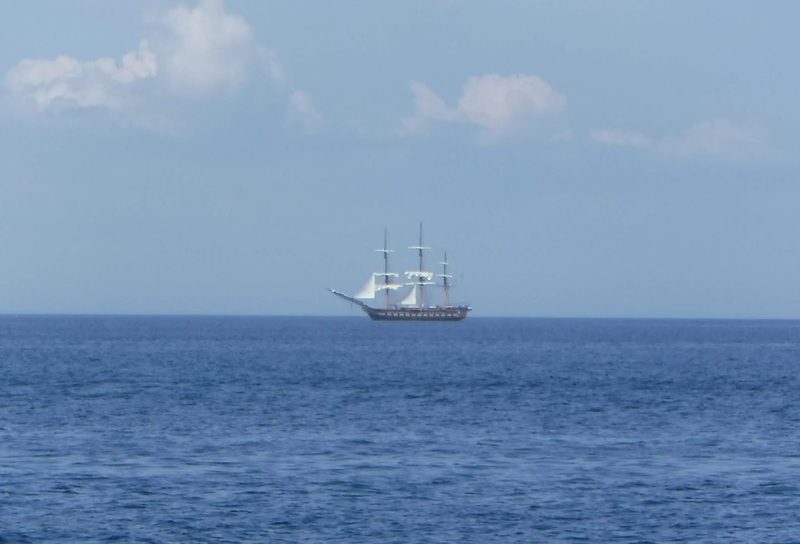 Oliver Hazard Perry on Cape Cod Bay. The bay is incredibly calm today. The water is so flat that Angel the cat has been up and about a good bit since leaving the canal. 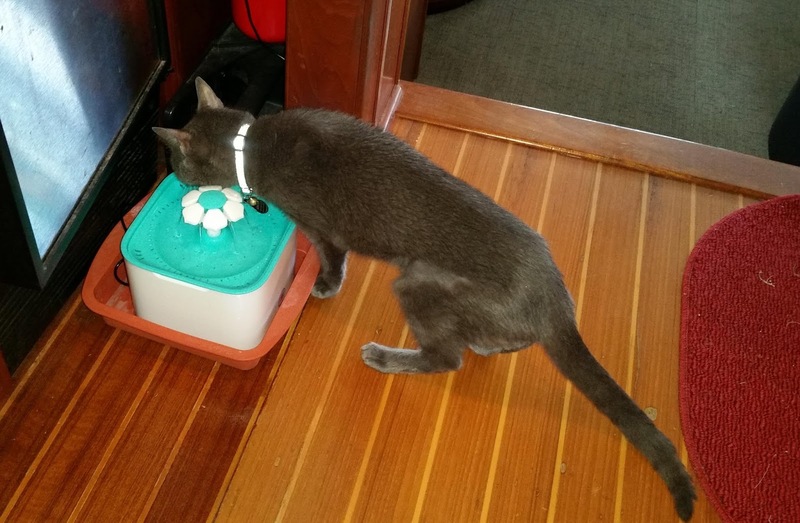 Louise caught her while she was taking a drink from her new cat fountain, one of the things we had delivered in Greenport. Angel has always had to splash her water with her paw before taking a drink, and this has put a stop to that as well as increased her water intake, perhaps stemming the need for more subcutaneous fluids. Angel drinking from her cat fountain. The silicone cake pan contains spillage under way. In a short while we will be in the hook of Cape Cod, hunting for an anchor spot among the hundreds of mooring balls. We expect to spend at least two nights here, and maybe a third before heavy weather moves in that will stir the bay up into five-foot seas; we'll clear out and make Massachusetts Bay or points north before the seas pick up. I'll likely post again once we're under way out of P-Town.